Referee Eric Otogo during the 2015 Africa Cup of Nations semifinal football match between Ghana and Equatorial Guinea at the Malabo Stadium. 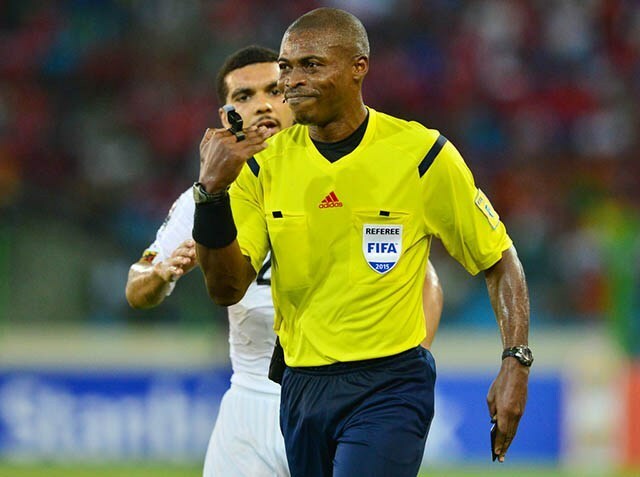 KAMPALA – With just over a week to the AFCON qualifier between Uganda and Tanzania, the Confederation of African Football (CAF) has appointed Gabonese, Eric Otongo Canstane as the center referee for the game. The Gabonese referee is one of a few Africans that are moving places lately, officiating at the 2015 FIFA U20 in New Zealand. He was also one of the stand-out officials at the 2015 African Cup of Nations in Equatorial Guinea and Gabon, officiating the semi final between Ghana and Equatorial Guinea that saw the hosts lose 3-0. Apart from 2015, Otongo has served as referee at the 2012, 2013 and 2017 African Cup of Nations final tournaments. He has also been on duty for the FIFA World cup Africa Qualifiers, FIFA friendlies and CAF Champions league games. He will be assisted by officials from Gabon and Chad for the mouthwatering contest with Moussounda Montel being the1st assistant referee and Issa Yaya the 2nd. Uganda will host Tanzania in the crucial AFCON qualifier on Saturday 8th September 2018 at Mandela national Stadium in Namboole. This is the second game for both sides in Group L with Uganda still on top on three points following a 1-0 win in Cape Verde. Tanzania are third after drawing at home to Lesotho in their first encounter. Lesotho host Cape Verde in the other Group L encounter on the same weekend.